Candidates that register for standard first aid courses will also receive cardiopulmonary resuscitation training. This rule applies for candidates taking standard first aid courses throughout Canada including in Vancouver, Surrey, Kelowna, Edmonton, Calgary Winnipeg, Regina and Ottawa. Candidates have the option of selecting from 3 different levels of CPR training. Prices can vary depending on the CPR level. Course length may increase as CPR level becomes more advanced. First aid content does not change regardless of CPR level partnered with the standard first aid course. CPR level “A”– This is the most basic level of CPR. With this CPR level candidates will only learn CPR rescues for adult and child victims. AED training and certification is included. CPR level “B” – This is a obsolete CPR level. All the content of a CPR level “B” course is included in CPR level “A”. CPR level “C” – This is the most popular level of CPR training partnered with standard first aid. It commonly comes standard with the course. With this CPR level candidates will learn CPR rescue techniques for adult, child and infant victims. AED training and certification is included. CPR level “C” for health care providers (CPR “HCP”) – This is the most advanced CPR level that can be partnered with a standard first aid course. Candidates that select this CPR level will learn CPR rescue techniques for adult, child and infant victims. Candidates will also learn to do CPR with trained back-up and more advanced equipment such as bag-valve masks. AED training and certification is included. 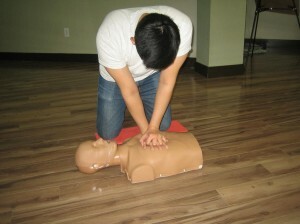 Selecting CPR “HCP” will likely increase the cost and length of the standard first aid course. Candidates have the option of re-certifying the CPR certificate with a standard first aid re-cert. Many employers request that candidates re-certify CPR certification more frequently than the first aid component. All of our training partners located throughout Canada offer stand-alone CPR re-certification courses. If candidates require CPR-only certification, our providers throughout Canada also provide those courses. Prior to registering for a standard first aid course candidates need to know what level of CPR training they need partnered with the course. We recommend contacting your employer or school to determine which level of CPR they require you to have.